Easter is on the way! 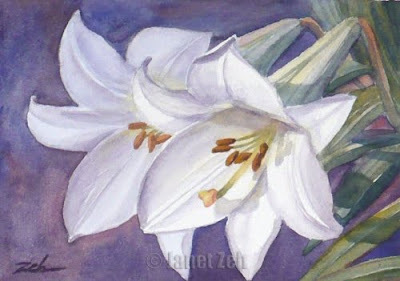 To celebrate this happy season, here is a pair of pure white lilies blooming joyfully in the sunlight. Calla lilies... I never thought of them as weird, but guess you're right. They are pretty as well. Lovely to paint - I'll have to do some this summer when they bloom.